BFFs Kaylan and Arianna have a full-proof plan for surviving the move to middle school: a list of 11 things they want to do before turning 12. But things don't go exactly as planned and the two girls must figure out how to keep their friendship from falling apart! 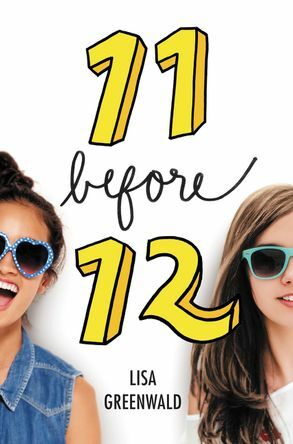 Fans of Lauren Myracle and Wendy Mass will love acclaimed author Lisa Greenwald’s new duology about two best friends who kick-start middle school with a bucket list of eleven things they need to do to become AMAZING before their joint twelfth birthday party. The first day of middle school means trading in freeze tag at the pool for new schedules, fabulous outfits, and a fresh start. But for eleven-year-old Kaylan, the chaos of new locker combinations, cafeteria cliques, and potential first kisses is more than she can handle. She dreads the start of sixth grade and feels like she wants—no, needs—a winning game plan.Luckily, Kaylan and her effortlessly chill BFF, Arianna, have a fool-proof plan for tackling transitions: a list of eleven things they need to do to totally transform themselves before they both turn twelve in November. But between making guy friends, getting detention (and makeovers! ), helping humanity, and having super-candid conversations with their moms about their flaws, the first 100 days of school turn out worse than Kaylan ever imagined. Kaylan and Ari forget to focus on their friendship and soon their loyalty to the list—what was meant to help them keep it together—becomes the very thing tearing their lives apart.